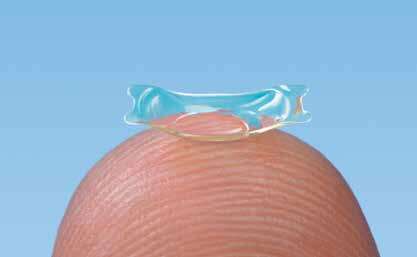 The ICL is a tiny contact lens, smaller than a dime, that is surgically inserted in your eye (Figure 20). It floats in the space behind your iris and lens and you don’t feel it (Figure 21 on page 86). It corrects your vision just like a regular contact lens, except you never have to clean it or remove it. To implant the ICL, the surgeon makes a small incision, less than 1/8 inch wide, at the junction of the cornea and sclera (the white part of the eye). The lens is folded up and gently inserted into the eye, where it unfurls. The lens is tucked behind the iris, and the procedure is over. No stitches are needed—the tiny incisions seal themselves. The ICL is manufactured from a soft foldable material that contains natural collagen. Because the cornea is actually composed of collagen, this material provides excellent biocompatibility and superior optical capability. Figure 20. An implantable contact lens is soft and flexible, like a regular contact lens, but much smaller. The center portion of the lens corrects vision, and the four corners hold the lens in place in the eye. Biocompatibility— The collagen copolymer material of the ICL is not considered a foreign object by the body’s immune system. Comfort—Patients can’t feel the ICL in their eye. Invisibility— No one else can see the ICL in the eye. Simplicity—Unlike traditional contact lenses, once the ICL is implanted in the eye, there is no additional maintenance needed. 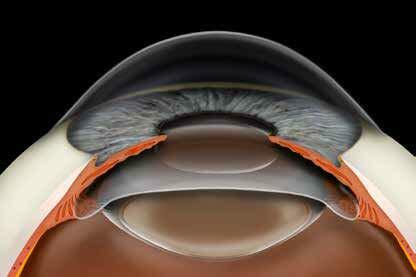 Removability— The ICL is designed to be permanently placed in the eye. However, the lens can be removed if a patient’s vision changes or if it needs to be removed or replaced for any reason. Figure 21. Soft and pliable, an implantable contact lens is rolled up and inserted into the eye through a tiny incision. It sits in front of the natural lens (Arrow ). It provides excellent vision correction and is comfortable. It eliminates the routine removal and cleaning required of a regular contact lens. The ICL can be made with astigmatism correction, just like soft contact lenses, so it can correct both nearsightedness and astigmatism, but this version is not FDA-approved in the United States as I write this. I am hopeful that by the time you are reading this, the FDA will have approved the astigmatismcorrecting version in the United States. In the meantime, we correct astigmatism combined with nearsightedness by doing the ICL procedure first, and then doing LASIK several months later for the residual astigmatism. The disadvantage of this approach is that it requires a second procedure. The advantage is that the LASIK enhancement also allows us to correct any residual nearsightedness or farsightedness at the same time.